Those were the words of Robert Morris coach Derek Schooley as his team prepares for an improbable sixth straight trip to the Atlantic Hockey semifinals. A little over a month ago, it would have been easy to call it a rebuilding year and simply move on with the process of learning for the Robert Morris Colonials this season. A young hockey team featuring a roster with 11 freshman found themselves mired in a 1-9-0 stretch and eventually in 10th place in the 11-team Atlantic Hockey standings. It was looking to be a hard season to swallow for a program that had grown accustomed to 20-plus wins a season and opportunities to make an NCAA tournament appearance. So the fact that they are, for a record-tying sixth time in a row, appearing in the Atlantic Hockey semi-finals this weekend in Buffalo, New York might come as a shock to those less familiar with the team. But the faith that their moment would come never left the locker room. 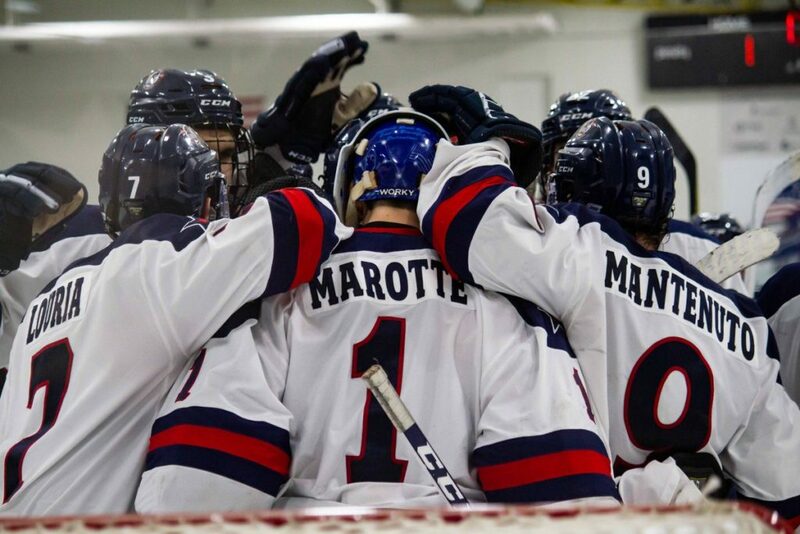 The season-ending sweep of in-state rival Mercyhurst finalized the Colonials’ push for home ice in the first round of the Atlantic Hockey playoffs. That confidence kept rolling through two consecutive playoff series that have seen significant contributions come from not only upperclassmen, but also from the new additions. Freshmen forwards Nick Lalonde and Justin Addamo both scored game- and series-winning goals against Holy Cross and Bentley, respectively. The battle-tested team has learned to play to their strengths and has overtaken games that were up for grabs. Leading the way from the net, junior goaltender Francis Marotte has been playing some of the best hockey of his career. Marotte’s playoff performances have seen him stop pucks that could have ended the season for his team with all the calmness that has been his trademark over the years. He has raised his career playoff save percentage to over .940 and has been one of the biggest factors in the winning lately. Perhaps the biggest tip of the cap for the Colonials goes out to a senior group that elevated their play and helped their teammates perform at a higher level when the team needed it most. Forwards Alex Tonge, Michael Louria, Kyle Horsman, Brandon Watt and defenseman Eric Israel have each had impact moments in almost every game in the 6-1-1 stretch. Their experience and leadership have helped mold a group that stands poised to reach an NCAA tournament. At a time when it would be easy to start looking ahead to life after NCAA hockey, the group rose to the challenge and have shown no inkling of wanting their college careers to end just yet. Robert Morris will face top-seeded AIC on Friday at 4:35 p.m. at Harbor Center in Buffalo. That game will be broadcast on ESPN Pittsburgh (AM 970/FM 106.3). Army will face Niagara in the second semifinal. The championship game will be played Saturday night.